We do the work…. you have the fun!!! Thank you for your interest in the Top Fun Party Packs for children. We believe in making your child’s memories of their birthday ones they will cherish and remember for a lifetime. We know all too well how difficult it can be preparing for the party, trying to keep the kids happy and ensuring everything goes according to plan. 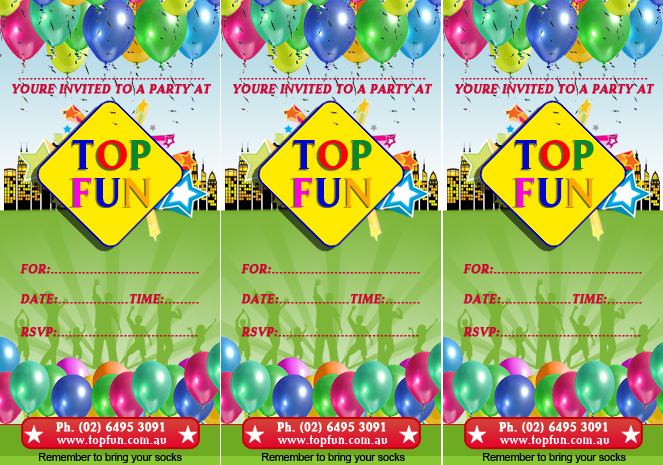 The staff here at Top Fun have had lots of practice when it comes to organizing parties, so why not sit back and relax and let us plan the perfect party for your child! We offer 2 spectacular Party Packs (shown below), catering for all budgets and all ages. There’s a great selection of activities to keep everyone busy, with excitement and fun our top priority. Delicious food from our kiosk is included in every party pack. We also offer helium balloons. Contact us today on (02) 6495 3091 and remember “We do the work…you have the fun !!! Like us to keep up to date! Find out about Top Fun Gift Vouchers!